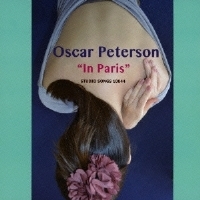 Description: In Paris captured the powerful and ever-swinging Oscar Peterson Trio in an exciting live concert in Paris in 1969. At that time, Peterson was signed with Germal label MPS, and was having a second "golden years" with his superb trio with bassist Sam Jones and drummer Bobby Durham. In the same year Peterson recorded for MPS the classic album Hello Herbie with guitarist Herb Ellis. While the sound quality leaves something to be desired, the live performance of this trio is red hot and very exciting. It would be interesting to compare these performances with their MPS recordings. Newly remastered in Japan based on the original mono master tapes, this reissue CD is an important document of the Oscar Peterson Trio in 1969. A must-have item for his fans! Recorded live at The Salle Wagram, Paris, in 1969. This Japanese reissue CD released by Studio Songs in May 2014. Mono.